The word angiography has originated from the combination of two Greek words i.e, angion meaning 'vessel' and graphein meaning 'to record'. 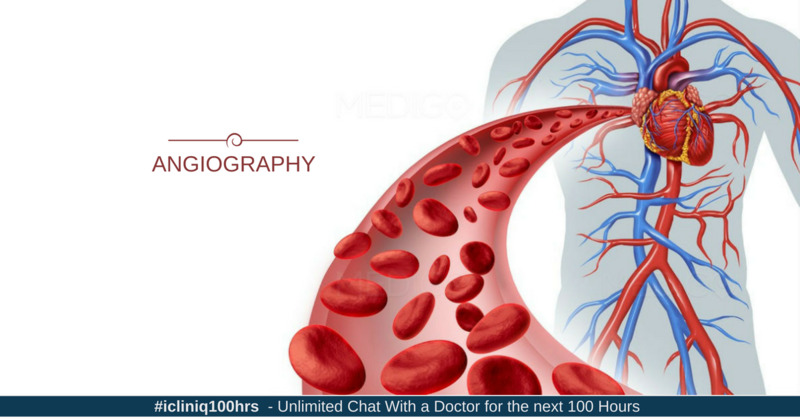 Angiography is a technique used to see the inside i.e, lumen of blood vessels specifically arteries/arterioles/capillaries (arteries carry oxygenated blood from heart to the different body parts and organs). It is different from venography which involves the imaging of veins (veins carry deoxygenated blood from body parts to the lungs). It is interesting to know that although angiography is most commonly done to diagnose Coronary Artery Disease (CAD) of the heart, this technique was first discovered and used to diagnose the various vascular disorders of the brain instead of heart when a neurologist named Egas Moniz first performed cerebral angiography in 1927. In 1929, Dr.Forssmann first introduced this technique for diagnosing heart disorders when he himself passed a catheter from a vein in his arm, pushing it into the right chamber of his heart and demonstrated its position by taking an x-ray. Angiography is performed by injecting some radio-opaque dye in the blood vessel and then taking images of the concerned vessels using techniques based on x-ray imaging. Angiography is considered as one of the most specific laboratory imaging investigations in the assessment of anatomy and physiology of arterial blood vessels. The procedure was associated with some complications as it involved introduction of a sharp device (catheter) in the blood vessels which could puncture and damage the blood vessels, but with time Seldinger technique was discovered in which no sharp device was required to stay inside the vessels. In 1977, coronary angiography was performed for the first time in an awake patient, earlier it used to be performed under anaesthesia. 1) Coronary angiography: It is done to diagnose the narrowing of coronary arteries which supply blood to the walls of the heart and their narrowing/blockage leads to myocardial infarction/ischemia i.e, in simple language, a heart attack. Is a ketone diet good for those who are diabetic? Father died during angioplasty due to pulmonary edema. Need second opinion. 2) Cerebral angiography: It is done to diagnose abnormalities of the blood vessels of brain. 3) Pulmonary angiography: It is done to diagnose pulmonary embolism (blockage of main vessel of the lung). 4) Peripheral angiography: It is done to diagnose the occlusive disease of the arteries of limbs specifically legs. 5) Renal angiography: It is done to diagnose renal artery stenosis (narrowing of arteries that supply blood to the kidneys). 6) Spinal angiography: It is done to diagnose vascular malformations and certain tumours of spine. Catheters made from hollow metal pipes were used in dead bodies to study the function of cardiac valves in as early as 400 BC. In USA, coronary angiography is the second most common operative procedure performed with around 4 million procedures every year !! Pioneer of cardiac angiography Dr.Forssmann could not get even a single patient to perform this procedure. At last he performed the procedure by himself and on himself !! Do not waste crucial time, instead rush to the nearest super speciality hospital as soon as one develops the symptoms of impending heart attack or brain stroke. Because, lesser the time to initiate interventional procedures aided by angiography, better the results are. Infact the best outcome in angiography aided angioplasty in the patients of coronary artery blockage (heart attack) is when the procedure is performed in less than two hours after initiation of the symptoms. Do you have a question on Heart Attack or Angioplasty? Do you think I have WPW syndrome? Which one is better angioplasty or bypass surgery?